The F&I (finance and insurance) department is where the car deal is closed and the sale finalized. It's a complex process, and your F&I manager is a highly trained specialist. Your dealership's F&I specialist must close the car deal using a wide variety of sales closing tools and business forms you'll find on our website. At the same time, they must maintain a high level of customer satisfaction, pay close attention to dealership profit margins, insure regulatory compliance, understand the psychology of the car buyer and maintain high ethical standards to protect the auto dealership's reputation. Professionals frequently use menus as closing tools and to present the auto dealer's customer such auto protection products as: Credit Insurance, GAP Protection, Vehicle Service Contracts, Lease Wear and Tear, and Environmental Protection. To accomplish this complicated phase of the purchasing process, and close the car deal both successfully and profitably, the well trained F&I specialist knows from their training that they must be highly organized and have all the right auto dealer F&I supplies at their finger-tips to avoid costly mistakes. 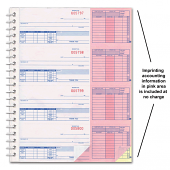 Estampe has genuine online savings for a wide variety of automotive F&I forms. If your F&I department needs custom forms, we also sell multi-part carbonless custom F&I automotive business forms at the best pricing found anywhere. We Owe Forms: Avoid costly misunderstandings and confusion with this “WE OWE” written record of all promises. Using we owes forms, vehicle deliveries can be arranged so customers have confidence all additional equipment or services promised will be done at their convenience.